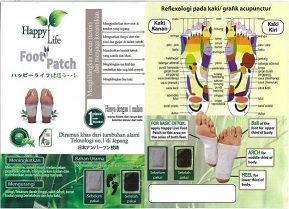 Foot reflextion plaster for basic detox. Apply foot patch to the area of the soles of both feet before to to sleep at night, and the patch will be black in the morning. This is because of the secret non chemicals starts working the same as foot reflextion. It focusses on all area of our boddy which starts or ends at our foot sole, and detoxes our boddy overnight, you will be feeling better and fresh, this amazing products helps again all kind of small remedies, tired, pain, fever, cold, flue etc. Adheres to the skin like a thin film patch. Ingredients penetrate directly to the affected site.